Here’s another great find from the SuperZoo Trade Show last week! It’s Kitangle, a new designer litter box with some nice features. Now, I think we can all agree that it’s hard to please everyone with a single litter box design. First of all, enclosed litter boxes aren’t for everyone, but if you and your cat are both okay with an enclosed litter box, you will want to know more about Kitangle, plus you can always use these without the lid and take advantage of the other awesome features. First, the clean modern design of Kitangle caught my eye. Kitangle comes in two styles, the Corner Kitty and the Slope Style. The corner box measures 18.33″ x 18.33″ x 15.75″ tall and the sloped box measures 20.75″ x 14.75″ x 19.34″ tall on the high side. The large opening is designed for senior cats to easily step into the box. The top is removable and the inside surface is smooth, both features that make for easy cleaning. I think the best feature is that the boxes have very high sides and they are a single piece of molded plastic, no cracks or crevices to clean! This is a good design for cats who stand and pee and for extreme diggers. Kitangle boxes are made from heavy duty plastic, they are not flimsy at all! They come in a range of designer colors. These really are unlike anything else I’ve seen, and I talked to the company owner and designer who put a great deal of thought into the design. Both styles are available from kitangle.com. The Corner Kitty box is $169.99 and the Slope Style is $179.99, both plus shipping from the company’s warehouse in Colorado. 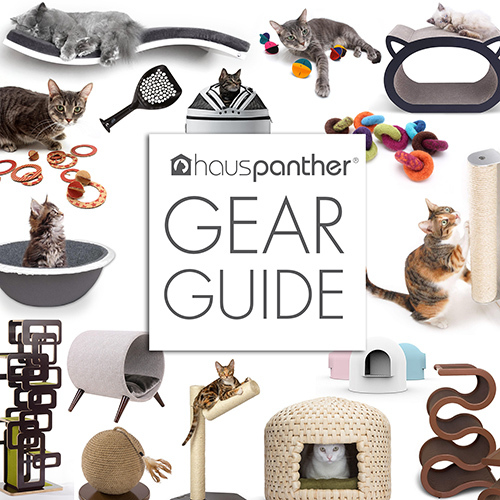 Enter To Win a Cattino Cat Shaped Scratcher, Perch & Lounge! Plus Discount Code! Holy cat! $169 for a litter box? They’re pretty, but priced waaaaay too high. They are very attractive and I love the shapes and colors they come in. However, they appear to be waaaay too small to me. Perhaps it is just the way they appear in the photos but they don’t seem tall enough to let the cat stand up or even comfortably crouch when they are, ahem, doing their business. Additionally, they just dont seem to have enough space overall to let the cat turn around and get comfortable. As beds, however, they would probably be perfect! Love this box but with 3 cats, I need at least 3 boxes and that I’d quite a hefty price tag. It is unaffordable for me, anyway. I agree with the other posters; make them larger and reduce the price. Having done this, they would be excellent boxes and I love the array of colors and choice of shapes, covered or not! Very cool looking but my cats would just go in and pee out the door. I’ll be more excited when I see one that has stairs to get into it’s so tall 😉 Currently I’m using storage tubs and even then errr, stuff happens. I agree with another comment that they would make a great cat bed though. I just got my black slope style litter box in the mail and I love it! As soon as I took it out of the box, I could tell the quality was fantastic; it looks like a piece of furnitur in my home! I love how thick and sturdy the plastic is and having it molded as one piece was brilliant! I love that there are no connectors or small nooks for urine to dry in and stink. All I have to do is remove the lid and cleaning is simple with scoopable litter. I also really like the high sided walls to help with urine containment; no more peeing over the sides! My kitty weighs over 20 pounds and he is easily able to get in and move around! He is also a leg lifting guy, so the high sides truly are a miracle! Thanks for such a great product, I highly recommend it!! I am ALWAYS looking for the perfect litter box. This design sounds great and I love the colors. I have a couple of smaller cats that would probably use it. But, Youch! it’s way out of my (price) league. Yes, please make a larger one. I will be glad to pay the price, but the size is a little too small. The corner one needs to be 20 x20. The sloped one needs to be wider. I will not use the tops for my cats, but many will, so as high as possible is good. Keep me up! via Hauspanther is a good way to reach your market. These look great, but they are sadly, totally out of my price range. Why would anyone spend 180 dollars for a litter box with a top that looks like furniture? I love my cat but it is no way I would spend that amount of money for a plastic box that does not clean itself…For the most part that plastic box is not convenient to use and would not be a part of my livingroom, kitchen, or bedroom decor.